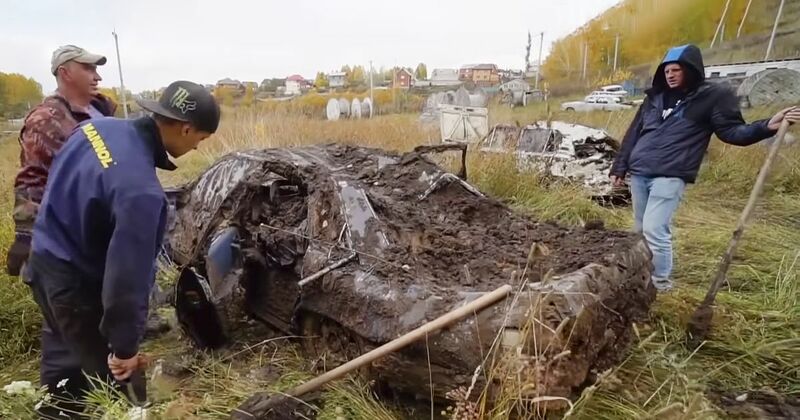 Last year the experimentalists at Garage 54 buried a trio of old cars in a wet, cold part of Russia with the intention of digging them up 12 months on and seeing if they still work. Well, that time is now. Vlad and the gang buried an old round-headlight Lada, a Toyota Corolla (or the Russian equivalent) and an Audi 100. You can watch that video below; it only aired three months ago, by which time they could be reasonably sure someone wasn’t going to dig-up and steal these ones like they did the first time Garage 54 tried this. This paragraph contains spoilers, so if you want to watch the video without knowing what happens, stop reading. If you’re fine with skipping ahead then the three cars were in a horrible state, crushed, filled and saturated by the wet earth around and above it. After serious digging work the Audi’s starter motor was destroyed and there was no chance of starting it. The Lada and Toyota, on the other hand, needed a lot of cleaning work but still managed to run all the same. If they weren’t basically now car pancakes you could probably sell them on.